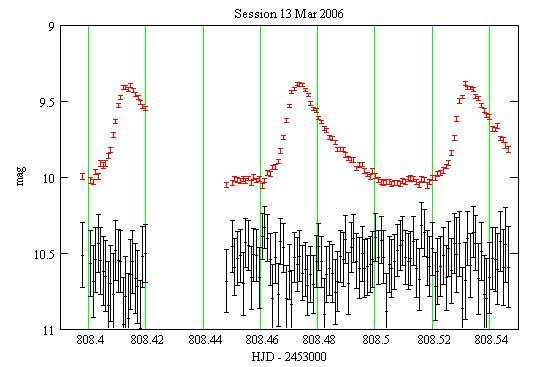 Time-series of this pulsating SXPHE star in a binary system are presented and compared with other observations. KZ Hya is a SXPHE pulsating star with a period of 85mn. The times of maximum variations show a wavy pattern interpreted as the effect of an orbital motion with a period of 9yr. I already observed this star in 2004. Here are new observations. 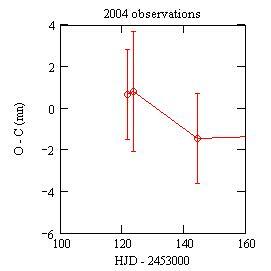 These 2005-2006 observations were carried out with a 203 mm SC telescope, a Cousins red filter and a SBIG ST7E camera (KAF401E CCD) (nearly the same setup as in 2004). 466 images were obtained. The exposures have all a duration of 60s. the K1 star is GSC 6638-00639 with a measured Rc magnitude of 13.10 and a standard deviation of 0.13. 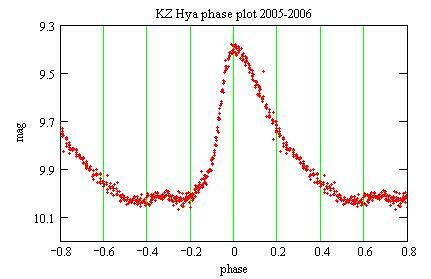 Red: KZ Hya, Black: the check star K1 magnitudes shifted by -2.5 mag. The error bars are +/- the 1 sigma statistical uncertainties. All the light curves are HERE. Note the bump at phase -0.3/+0.7. Red circles: my observations, Blue diamonds: ASAS, Green square: AAVSO, Purple square: ROTSE. 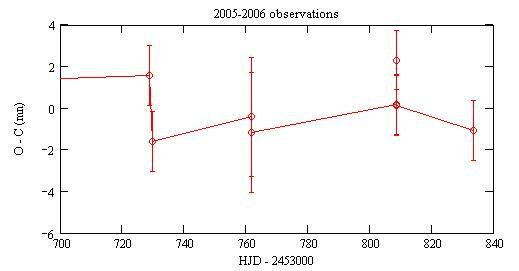 KZ Hya was observed in 2002 by Doncel et al (2004). 12 times of maximum are reported. These maxima are way off my ephemeris and of the ASAS observations at the same epoch. I suspect the publication to be in error: the reported times of maximum are daylight times for the observatory location! and with binary(HJD) the orbital modulation. Black diamonds: the 90 times of maximum from which the LY91 ephemeris is derived; Red dots: my 11 times of maximum; Blue dots: from ASAS observations; Green dot: from AAVSO observations; Magenta dot: from ROTSE observations. The cyan line is the binary function of LY91 with a 9 yr period. I also modified (by hand) the parameters of the binary function so as to have a good fit. The main difference with LY91 is that the period is 8.382yr instead of 9.262. All the paramerers are HERE. 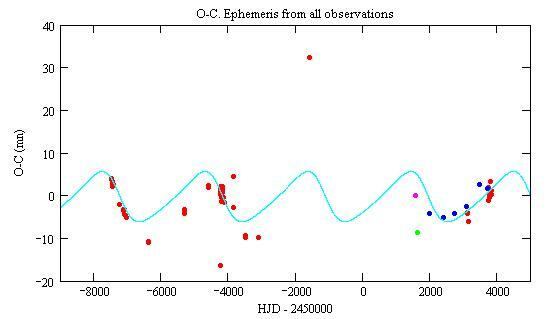 Red dots: the 90+11 times of maximum from which the ephemeris is derived; Blue dots: from ASAS observations; Green dot: from AAVSO observations; Magenta dot: from ROTSE observations. Cyan line: the orbital binary function. 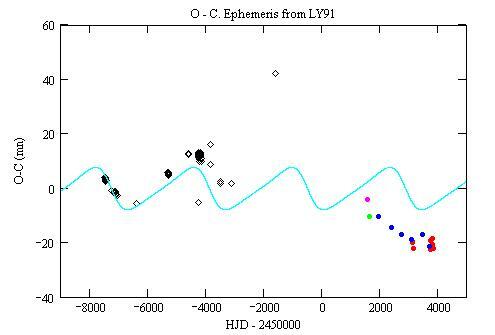 The pulsations of KZ Hya appear to be very constant (the beta2 term is very small). My observations support the duplicity model of KZ Hya. Assuming the total mass of the 2 stars is 2 solar masses, the diameter of the orbit is 5.02au and the inclination is 17°. The angular separation is certainly much smaller than 0.01", much too small to be observed. The companion may show up spectroscopicaly, however this was not noticed by McNamara & Budge (1985). Doncel F., Troche A., Noguchi T. (2004) UNPSA 15 29 (available from NASA ADS); Ap & Sp Sc 290 399 (I have no access to it). Hobart M.A, Peniche R., Peña J.H. (1985) Rev. Mexicana Astron. Astrof. 11 19. Liu Yanying, Jiang Shiyang, Cao Ming (1991) IBVS 3606 [LY91]. McNamara D.H., Budge K.G. (1985) PASP 97 322. Pojmanski G. (2002) Acta Astronomica 52 397. Przybylski A., Bessel M.S. (1979) MNRAS 189 377. 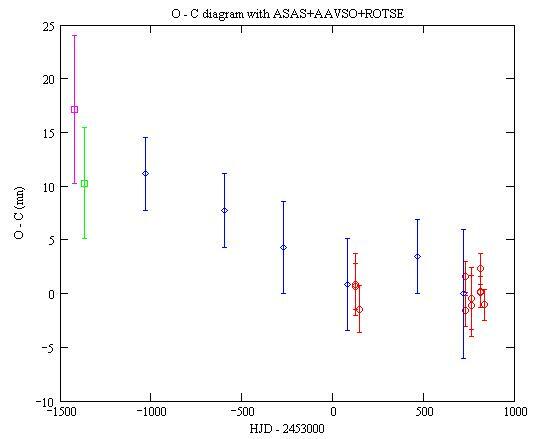 The variable star observations from the AAVSO International Database contributed by observers worldwide are acknowledged.